Background: The existence of a “short esophagus” continues to be a source of controversy surrounding paraesophageal hernia repair and therefore a precise definition of the “short esophagus” remain elusive. Intrinsic shortening of the esophagus results most commonly from the chronic inflammation that accompanies gastroesophageal reflux disease (GERD). Surgical treatment of the “short esophagus” with Collis gastroplasty has been criticized for creating a non-physiologic distal esophagus with the potential for esophageal dysmotility and poorer outcomes. The aim of our study was to review the outcomes of antireflux procdures with and without Collis gastroplasty. Methods: We defined short esophagus as a GEJ that could not be surgically mobilized to lie 2 cm below the hiatus without tension. A retrospective study was performed of prospectively gathered data for patients who underwent laparoscopic paraesophageal hernia repair (LPEHR) between 2001 and 2009. A total of 106 patients out of 251 patients (42.2%) were identified as having a shortened esophagus and had undergone lengthening procedure with Collis gastroplasty. Operative outcomes were compared with the control subjects who underwent LPEHR without Collis gastroplasty. These outcomes were derived from data collection which includes pre- and post-op UGI score, EGD score, symptom score, medication score as well as QOLRAD score. Collis gastroplasty combined with fundoplication is an effective procedure for patients with a shortened esophagus and provides equivalent outcomes in terms of symptoms, medication use as well as QOLRAD score. We also noted no difference between the Collis and the Non Collis group in terms of dysphagia symptoms both pre and postoperatively. 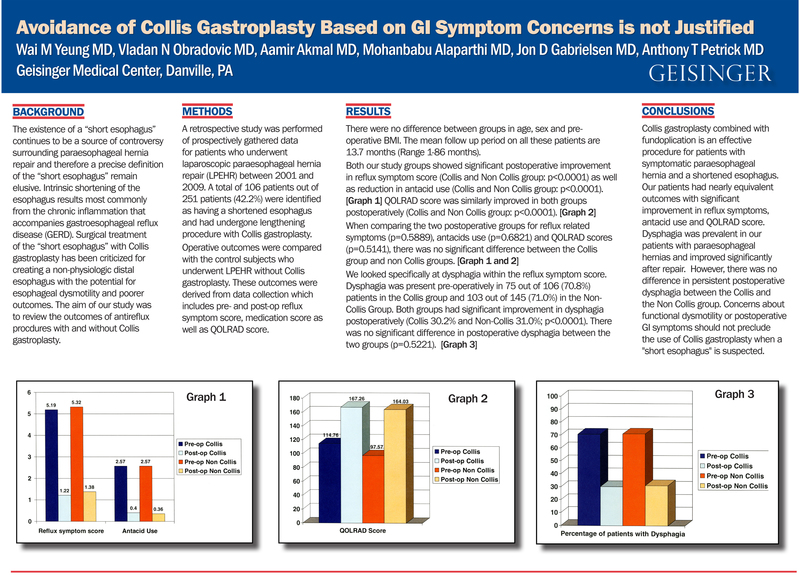 Concerns about functional dysmotility or postop GI symptoms should not preclude the use of Collis gastroplasty when a “short esophagus” is suspected.